This past week, I saw the film ‘Death by China’. This film is based on the book written by Peter Navarro and Greg Autry. I didn’t know what to expect going into this film, I hadn’t heard anything about the film, but my doubts about this film were instantly soothed when I heard the sweet, smooth voice of Martin Sheen begin narrating film. I remembered that he had also narrated Tibet Cry of the Snowlion, so Death by China automatically gained some credibility with me. Like any other documentary film, the footage consisted of many interviews, and within the first, say, 5 minutes of the film, Lhakpa Tsering of the Free Tibet World Bike Tour was shown being interviewed about his views on China’s economic prowess while holding a sign advocating for Tibetan freedom. Throughout the film, Tibet was referred to numerous times. While I was ecstatic that Tibet was mentioned so many times in this film, this wasn’t the only reason I ended up loving this film. Boycotting Made-in-China is the first Tibet campaign I remember being a part of as a young Tibetan. I remember, it was probably around 1992 or so, seeing a large photo of my Pala’s face on the front page of our local newspaper when our Tibetan community launched a campaign to boycott toys made in China. Along with the photo of him and a little toy tiger, was an interview with my Pala, representing our community, and discussing the campaign and the implications of buying toys made in China and it what it meant for Tibetans, as well as Canadians. I also remember around that same time, gathering with other members our Tibetan community outside the Toys’R’Us in our city, handing out balloons and pamphlets with messages urging people to boycott toys made China. I also remember a photo of my sister, who was probably about 3 years old or so then, made the local paper, with an image of her sitting in a shopping cart surrounded by balloons with the message Boycott Made-in-China and an image of a toy bear with a tear falling down its face. This was probably my first taste of activism, and the article with my Pala was probably the first time I read any type of literature surrounding Tibetan activism – even though I was probably only 6 or 7 then, it made so much sense to me and was sure it would resonate with the Canadian public as well. And that’s where ‘Death by China’ comes in. 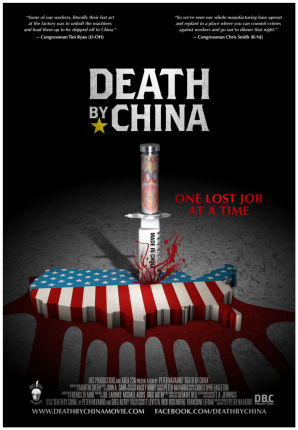 This film was so on the money, clearly explaining why people should not be supporting China’s economy through purchasing its goods, which in turn are supporting China’s unethical economic tactics (such as currency manipulation and illegal subsidies) – key to the destruction of the American economy (while this film focused on the American economy, much of it can also relate to other countries like Canada). One of the many facts that jumped out at me during the film was that while Apple, a [seemingly all] American corporation, employs 24,000 (or so, if I remember correctly) people in the United States, they employ 700,000 people in China! Can you imagine if those jobs had stayed in the United States, all the pressure it would help alleviate with the current state of the American economy. While I don’t want to give away all the points in the film, everyone should know that when doing business with China, it’s not business as usual – this film clearly illustrates this. China plays by its own rules with no regard for the foreign companies it does business with, or for global trade, business or currency regulations – let alone its own people. The only people who gain in trade with China are those at the top of the Chinese Communist Party and their cronies. By supporting trade with China, you’re not supporting workers in the factories and forced prison labour camps (laogais) who make little to no money producing your clothes, toys, and more and more even your food – you’re supporting the largest state-sponsored no-good gang of criminals in the world. Overall, I would say GO SEE THE FILM! The film interviews many reputable people including Economist Gordan Chang, former Canadian Secretary for State David Kilgour, Harry Wu of the Laogai Research Foundation, and numerous US politicians among others. It really is a must-see, especially with everything that’s going on in North America today (the US elections which had a large focus on its relations with China, as well as the potentially disastrous, secretive, and completely undemocratic FIPA Canada-China (Nexen-CNOOC) trade deal that’s being currently being reviewed by the Canadian Cabinet). All the knowledge you’ll gain from watching this film is something you can really add to your activist toolbox (along with what nycyak enlightened us with last week). Following the film, there was a Q and A portion where the audience was able to ask questions to a panel which consisted of Greg Autry, Kean Wong who produced the film Free China, and Jennifer Zheng, a former prisoner of conscience in China. I asked the panel if they could comment on how they see economic activities carried out against China by average people – like boycotting Chinese goods – as well activities that could be carried out at the higher government level such as trade reform with China affecting a) human rights in China and b) specifically Tibet. What China does is wrong. It throws the principles of fair trade out of the window….and for some reason we let it get away with it. I completely agree. China seems to be an elitist society by making the rich richer and the poor poorer. China’s unethical process for manufacturing goods decimates all other countries, like the United States who use more ethical processes. In regards to Tibet, boycotting Chinese products will perhaps hurt the workers more so than the elite. If the United States boycotted all Chinese products, the American consumer would be angry because most products seem to come from China. In order to crack down on China, the United States should take a stand and confront China more assertively and try to come up with a solution. Far too many countries like Tibet, are suffering because of the unethical business practices in China.